I’ve been asking myself, why on earth is Nags Head, North Carolina getting more storm coverage than the Brooklyn-Queens area in which almost 5 million people live? In terms of viewer interest, most New Yorkers and expatriate New Yorkers never lived in Manhattan. They want news about the storm preparations and damages in their communities, more than they do Manhattan. According to the 2010 census, the entire island of Manhattan has a residential population of 1.5 million people. Staten Island has fewer than a half million. The Bronx (not in Zone A) has 1.3 million. I saw one reporter at a virtually empty La Guardia Airport without once mentioning that it was in the Borough of Queens. That’s the same borough as Kennedy Airport. You know, where over 2.2 million people live. Reporters frequently mention the Battery in Manhattan, without mentioning that there’s also a Battery right across the river in Brooklyn. Brooklyn is the borough with 2.5 million people, almost double the Manhattan population. Much of Brooklyn and Queens is low-lying. Some areas are (or were) marshlands or barrier islands. Significant sections of Brooklyn and Queens are in the most flood-prone Zone A. Enormous swaths of Brooklyn and Queens are in the less-at-risk Zone B. The Gateway National Park stretches from Brooklyn into Queens, and encompasses Jamaica Bay and the Rockaways; flood-prone areas. My parents grew up in Queens. Before moving to Houston, I spent the first 26 years of my life growing up in Brooklyn; 5 years on Quentin Road and Ocean Avenue, 21 years in Canarsie. I’m as Brooklyn and Queens as they come, and I want to know what’s happening there. Why won’t any of the networks tell me? NYC storm surge flood zone map. Long Island storm surge flood zone map. This entry was posted in BUSINESS, MEDIA, OPINION - POLITICAL, SOCIAL, POLITICS/DOMESTIC, SOCIETY and tagged airport, borough, bronx, brooklyn, canarsie, city of greater new york, flood, hurricane, irene, jamaica bay, kennedy, kings county, la guardia, nags head, new york city, north carolina, nyc, queens, richmond county, rockaway, staten island, storm surge, zone a by Thinkwing Radio. Bookmark the permalink. 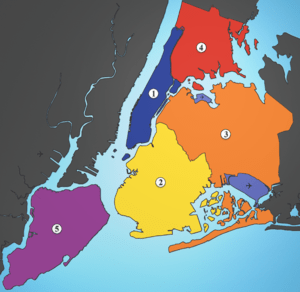 Pingback: HURRICANE IRENE NEWS FLASH: The City Of GREATER New York Is Bigger Than Just Manhattan!